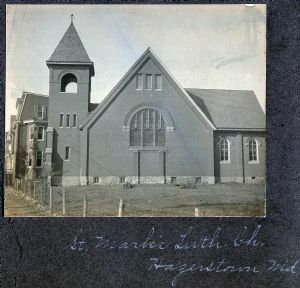 St Mark's Lutheran Church is located on Washington Avenue, Hagerstown. Their first church, built in 1893, serve the growing west end. It was a brick Queen Anne/ Romanesque building. The old church was replaced in 1929 with the present Gothic Revival church, from a design by J.A. Dampwolf and Son.